Since I'm spinning up (another) sweater from my big load of Polypay, I want to make sure the yarns I'm spinning are consistent. I have a problem with consistency - not so much over the short term (my yarn isn't necessarily thick-and-thin), but more over the long term. That is, the first ball of yarn I spin can be very different from the last ball I spin - in terms of thickness, as well as amount of twist. One way to deal with this is to spin all the singles first and then ply the thick ones with the thin ones to help with consistency. Another way is to pay more attention as I spin - it's time to get technical. I've always been a very 'seat of my pants' spinner - I enjoy the state of flow that I can get into while spinning, and I care less about the results. But, I know I will grow as a spinner if I learn to pay closer attention to the yarn I'm making. The numbers have always frightened me - twist angle, wpi, tpi, ypp?! Luckily, there is help out there. Ravelry, of course, is a wealth of information - some of my favorite spinning groups are Spin Tech, Advanced Spinning, and Spindlers. But one thing that is really helping keep me on track is an app I just discovered - it's called iSpin Toolkit, and it's available for iOS. I wish it were on Android too, since I would love to have it on my phone, but luckily I do have an iPod Touch. The app has a few different features - the most useful of which for me are the twist angle measure and the wpi gauge. 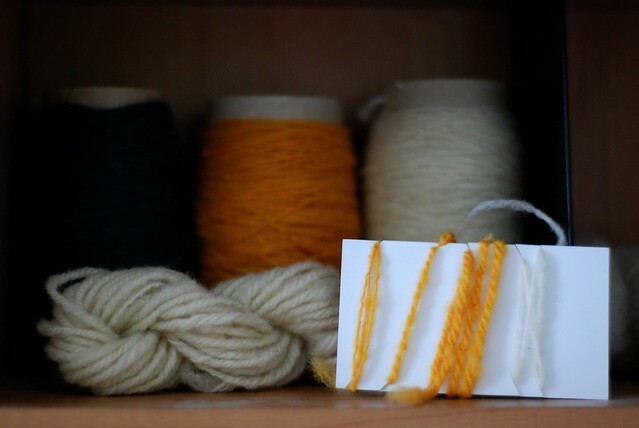 I do always measure wraps per inch when I'm skeining up a finished yarn, but I don't measure singles and it would break the flow of spinning to take out a ruler and wrap yarn around. This is more like those spinner's control cards - a series of horizontal lines and their wpi equivalent (white lines with a red border - when you can just see the red but can't see the white, you know you've got it right). It only takes a second to check that my single fits the same bar as it did at the start of the project - perfect! There are also a bunch of different spinning-related calculators included in the app, but apparently many of them are based on an erroneous formula so I would take them with a grain of salt. Unfortunately it doesn't look like the developer is working on the app anymore. However, the twist angle and wpi tools are useful enough that I still think I got my money's worth, even without the calculators. 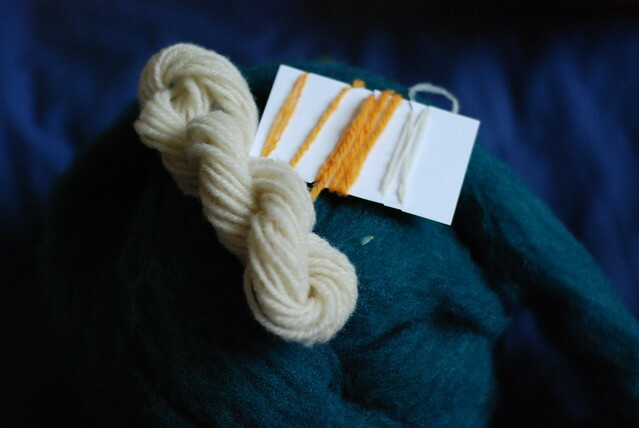 So between the app, spinning all the singles before plying, my effort to increase my focus, and a little card with some samples to refer to, I'm hoping to keep this project consistent over the course of nearly 800g of fiber. Time will tell!